As you may or may not know I have been designing and making bespoke stained glass and fused glass for over a quarter of a century! I love it now as much as ever if not more and throughly enjoy both the commissioning process and taking my courses. This is giving me a wonderful ‘family’ of students and customers all of whom are also in love with glass and realise that it has the potential to change your life! I mean it! The quality of light passing through coloured glass can be beautiful and uplifting. Unlike the sometimes sombre thought provoking stained glass made for places of worship and contemplation. I make windows for people, for individuals with individual likes, dislikes and tastes. This is what makes my job so satisfying and (if I dare say it) fun. Some of my students fall so in love with the process and finished results that they have found a new hobby and its my greatest pleasure to help them develop and grow. One of my students is having her first exhibition this week! I work mainly on my own and have done so for 12 years since leaving the workshop in London where I trained. Working on my own can have its downside. I rarely get out as I am very busy! Networking is not my thing, work is. But then in April 2009 I joined a social media site called Twitter. Since then I have ‘met’ loads of lovely like minded souls. Crafters, artists, architects, social enterprises, interior designers, garden designers, stained glass artists, foodies, bloggers, stone masons, willow workers… hey you name it I am meeting them and love to hear about the work they do and their thought on the world. I’ve even met a few in person, you know who you are you lovely people! Twitter has opened the world up to me, a stained glass artist working in my ‘shed’ on my own and I love it. On March 18th 2012 my Tweeting paid dividends as I entered a Twitter competition held on Sunday nights by Theo Paphitis, one of the BBC Dragons and entrepreneur. The competition was to Tweet your small business to @TheoPaphitis and give it the hashtag #sbs, which stands for Small Business Sunday. 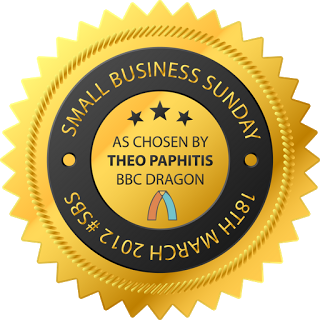 A couple of thousand small businesses Tweet Mr Paphitis every sunday night and he personally choses 6 to Re-Tweet to all his 233000 followers which potentially opens up ones business up to a wider audience. @TheoPaphitis #sbs I have a passion for decorative glass and traditional skills.I make beautiful windows to enhance living spaces and teach! I have been given a badge made by Dylan More @aquadesign and am looking forward to meeting him and other winners this Friday at a meeting in Birmingham! https://abinger-stained-glass.co.uk/wp-content/uploads/2012/03/Abinger-SBS-Badge-1.png 320 320 Amanda Winfield /wp-content/uploads/2016/02/logo-main.png Amanda Winfield2012-03-26 08:55:002016-11-23 15:51:44Horray!! Error: Error validating access token: Session has expired on Monday, 08-Apr-19 03:56:55 PDT. The current time is Friday, 19-Apr-19 12:08:47 PDT.